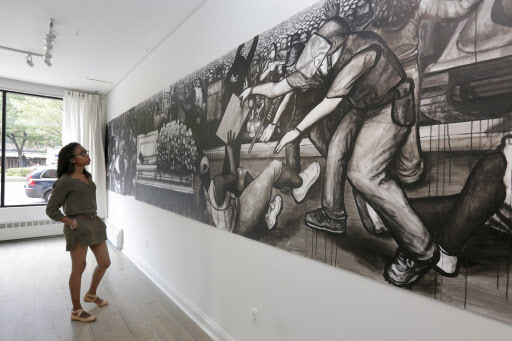 NEW YORK (AP) -- The opening of the Clara Francis Gallery on Wednesday in a renovated Harlem storefront was an exciting moment for Haile King Rubie. It was the first solo show for the 26-year-old painter, whose expressive works are all the more remarkable because he was born with Down syndrome. It also was another small step in the development of Harlem as an art gallery district. The neighborhood is still a long way from replacing Chelsea or Brooklyn as the epicenter of the city’s art scene, but Harlem is now home to about a dozen galleries and in the fall, two more big-name galleries are slated to open. The Elizabeth Dee Gallery will occupy a two-story building that is next door to the National Black Theatre and two blocks east of the Studio Museum. After many years downtown, Gavin Brown’s Enterprise is moving into three floors of exhibition space at a former brewery on West 127th Street. Those newcomers join longer-term residents like the Essie Green Galleries, renowned for such African-American masters as Jacob Lawrence and Romare Bearden. The newest addition, the Clara Francis Gallery, came about after area artists, curators and the community urged Rubie’s father, Bernardo, to mount a solo exhibition of his son’s works. The elder Rubie conceived it as a pop-up exhibition space where artists who might not otherwise have a place could show their art. He renovated an unused storefront adjacent to his Latin soul food restaurant on Adam Clayton Powell Jr. Boulevard, where he has long featured works by local artists, including some Harlem Globetrotters players. Future exhibitions will feature the photography of Kwame Braithwaite including his extraordinary images of Muhammad Ali, artists from Cuba and the history of the African-American Day Parade. Bernardo Rubie called Harlem “a very vibrant and fertile environment” for art. There are already two other galleries on the block. “I think people have always thought of Harlem as a hot bed of performance and nightlife, and I think visual arts or a gallery presence is an extension of that although it isn’t what people commonly associate with this area,” said Lewis Long, owner of the Long Gallery across the street, which opened in 2011. More than 200 people from all over the city attended the opening of each of his last two shows, he said. The growth of the gallery scene is just one of a number of changes that have come to Harlem in recent years, including an influx of fancier restaurants, costlier apartments and wealthier residents. Some of those changes have unnerved longtime residents of Harlem, who worry that the wave of gentrification will make the neighborhood unaffordable and ultimately erode its historic place as a center of black culture. “Attention on the arts, the fact that there's a broadening art environment is exciting for everybody,” she said.